and resources while playing Dash or Defend. 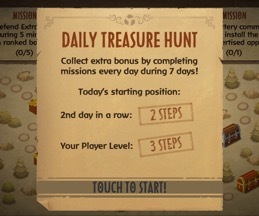 The treasure hunt button is located to the right on the main screen. It will glow when you can start a new run, and when there is a chest to collect. Every day you will get a starting position bonus equal to your player level plus the number of consecutive days that you have been treasure hunting. On the seventh day there will be a huge starting bonus, and then you start over on day one again. - Invite people you know to your new friend list. - Issue and accept challenges from players in your friend list. 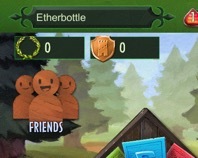 The friend button is located to the upper left of the screen. It will change look slightly when a friend is challenging you, when there is a friend reward to collect, or when a new friend has been added to your friend list. Click the button to go to your Friends page. To invite someone, press the Friends button to go to your Friends page and then press the large button at the top. This will result in a pop-up where you can select how you want to send the invitation (email, message, ...). Make your choice and the correct app will start, with a message prepared. The message includes the link that your friends should click. If your friend already has installed DoD, the link will open the game and connect the two of you as friends. If not, the link will take your friend to DoD on either AppStore or Google Play. Once he/she has installed and started the game, the two of you will be connected. In this case, there will be a reward for both of you to collect, once the friend has unlocked the Dominate mode. Dash or Defend for Android can now be downloaded from Google Play. Be sure to tell your friends who haven't tried it yet. Copy the link and send it to them! A mini-game that you can play while waiting for a Player vs Player battle to begin. You guide a Woodling Runner to pick up Ether bottles and avoid the firebomb towers. Every tap gives a momentary speed boost. Time your taps and avoid running off the screen.